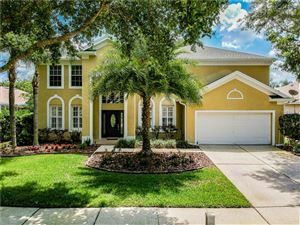 Kingshyre is a gated community located in New Tampa. The small community is situated near Covington, a 20-acre community park, Little League field. The community has excellent access to Downtown Tampa, Tampa International Airport, and Gulf beaches, Disney World, Sea World and Universal Studios. The residents enjoy picnics, rollerblading, hiking, biking, fishing and canoeing at the Flatwoods Wilderness Park. The Busch Gardens and Adventure Island is just 10 minutes away and The Florida Aquarium and Lowery Park Zoo are within 20 minutes driving. The New Tampa YMCA, movie theaters, shopping centers, restaurants is nearby. There are a number of superb golf courses nearby Kingshyre. Kingshyre offers almost 200 home sites placed among beautifully lined, winding streets and ponds. If you are seeking for a perfect location at Tampa, you have to remark Kingshyre the best.